The Ordnance Survey Landranger map for Northampton & Milton Keynes (sheet 152) covers this areas in Olney, with a scale of 1:50 000. OS Explorer map is for Newport Pagnell & Northampton South (Sheet 207) offers the scale 1:25 000. It is possible to take pleasant walks on the footpaths next to the river, exploring the wide, open meadows and staying within the boundary of Olney. You can access the meadows by starting at the St.Peter and St.Paul church. At the end of the lane, you can go through the gate onto the footpaths. 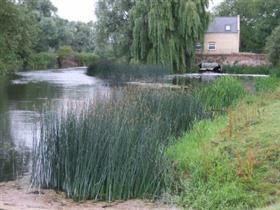 Or for a perfect Sunday stroll, take the footpaths over the River Great Ouse and up to Clifton Reynes. There is also a circular route starting and finishing in Olney, which is a 13km or 8 mile walk. It visits Clifton Reynes, Emberton and Filgrave. With thanks to the Ivel Valley Ramblers U40 group who posted the route on the link below. Pubs en-route at Clifton Reynes and Emberton. Possible picnic stops at Filgrave and in Emberton Park. The Loop to Clifton Reynes can be omitted if desired to make the route shorter.